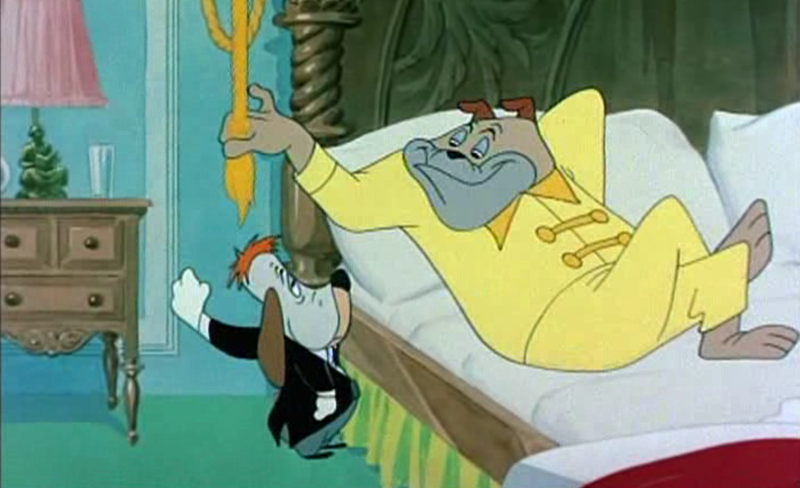 Droopy is a butler in a mansion who invites his incredibly strong brother Drippy to join him at work. The pair is told to let nobody into the house while the master’s away, but Droopy brings in his old pal, the tramp Spike. What follows is a series of confusion gags, in which Spike is pampered by Droopy and clobbered by Drippy. The comedy is less inventive than in earlier Droopy shorts, and ‘Droopy’s Double Trouble’ is arguably Avery’s weakest Droopy cartoon. Spike is in no sense the funny, mean cheater he was in earlier cartoons, like ‘The Chump Champ’ (1950) and ‘Droopy’s Good Deed’ (1951). He speaks with a strange, Irish(?) accent and is only a meek and unfunny victim of the confusion gags.